It’s been a while and I am so glad to be back with a new blog post. 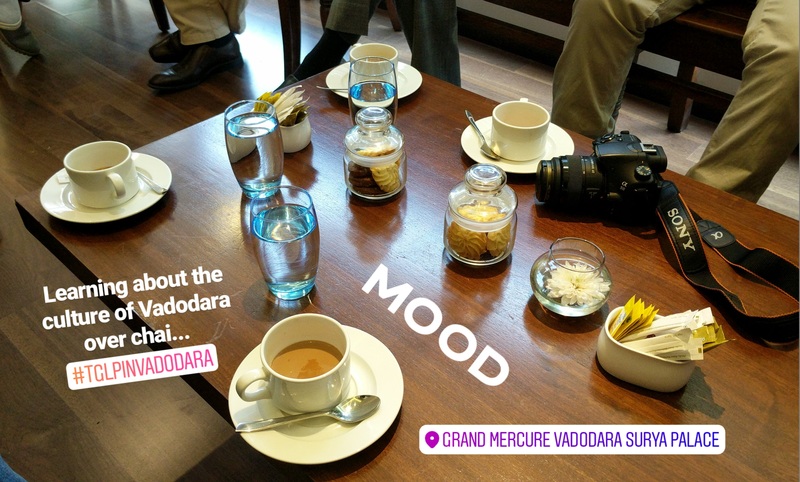 I recently visited Vadodara, a place I had never been to until now… when I was invited to check out the new Grand Mercure property. 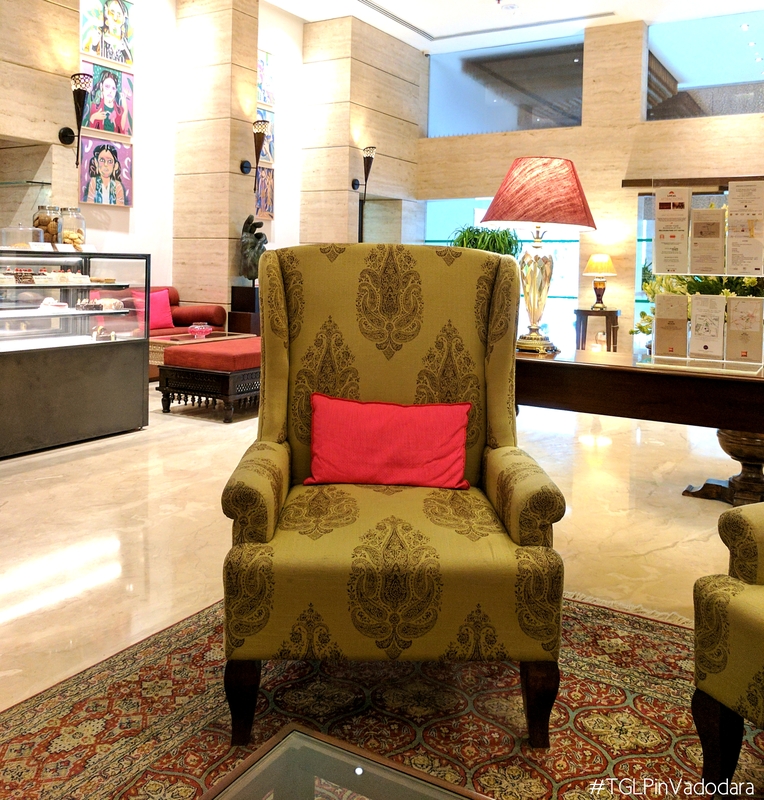 Previously known as Surya Palace, it is now officially known as Grand Mercure Vadodara Surya Palace. As 2 distinctive brands in their own respective rights, the amalgamation had to be an exquisite one. 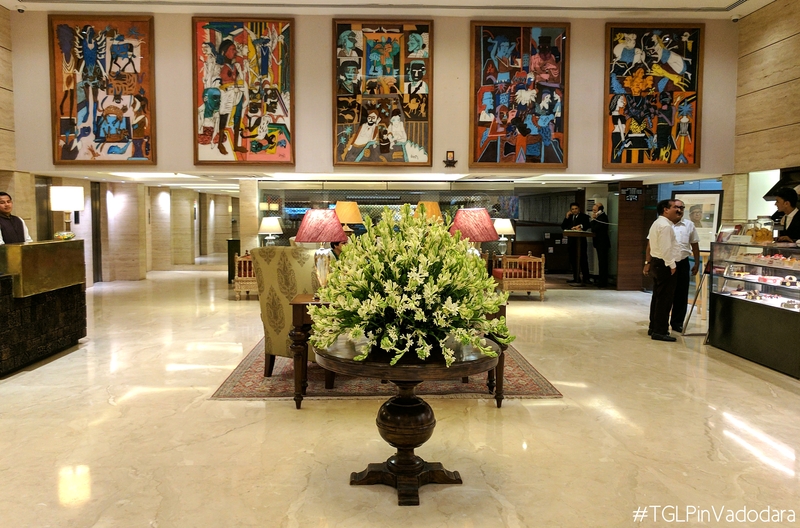 To begin with, the decor boasts of art and sculptures created by some of the finest artistes from all around the world, including local talents. The porch has works by Nagji Patel a well known artist, where his installations come to life. There’s another statement design installation by the renowned Japanese artist, Mia Uchi that aesthetically symbolises the 5 elements of the universe through the art of motifs. 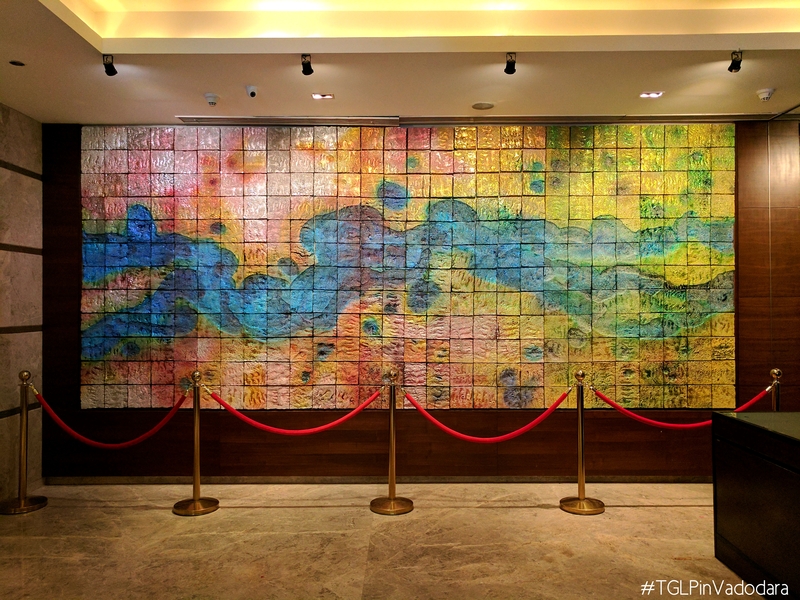 The lobby has an array of artworks… From a medley of art-deco and cultural inspirations to the stunning reception desk that showcases intricate batik work made out of discarded wooden blocks (used for traditional block printing on fabrics). 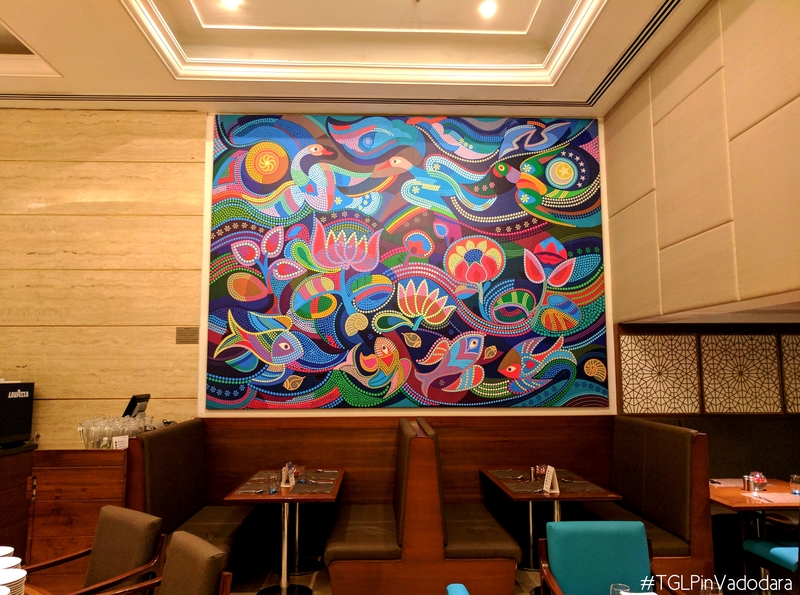 The massive artwork above the reception counter has been created by Yamini Sharma (the 6th generation member of the Pichhwai painters from Rajasthan) and is primed on burnt wood with a blend of colours and contemporary elements. 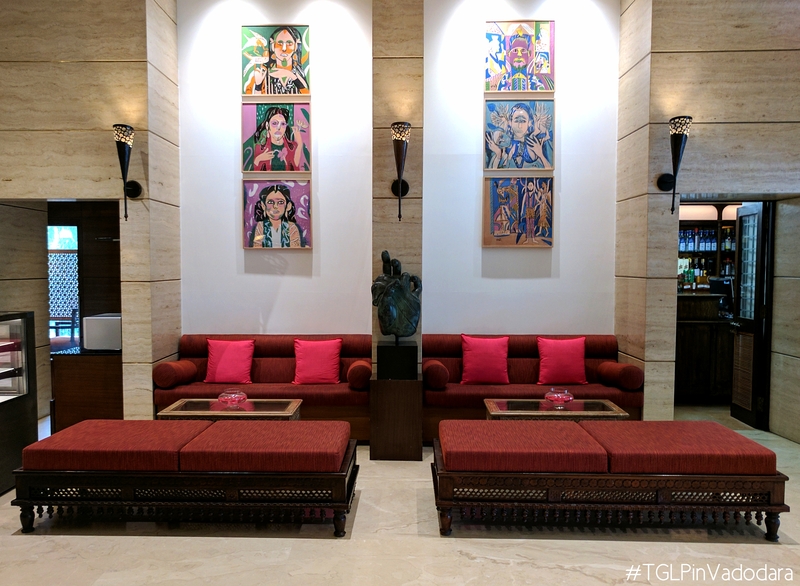 The recently unveiled paintings by Padma Vibhushan, Prof. K.G Subramanium in the lobby clearly depict the close bond the hotel shares with the prestigious M S University’s faculty of Fine Arts. Even the ballroom section has some stunning artworks that make the place unique. The ceramic works by prominent artist, P.R. Daroz is beautifully inspired from water bodies. And of course, Azure – the restaurant’s interiors could not have been complete without the touch of exquisite fine art. The grand artworks on display have been worked on by Jyoti Bhatt, a popular local artist. 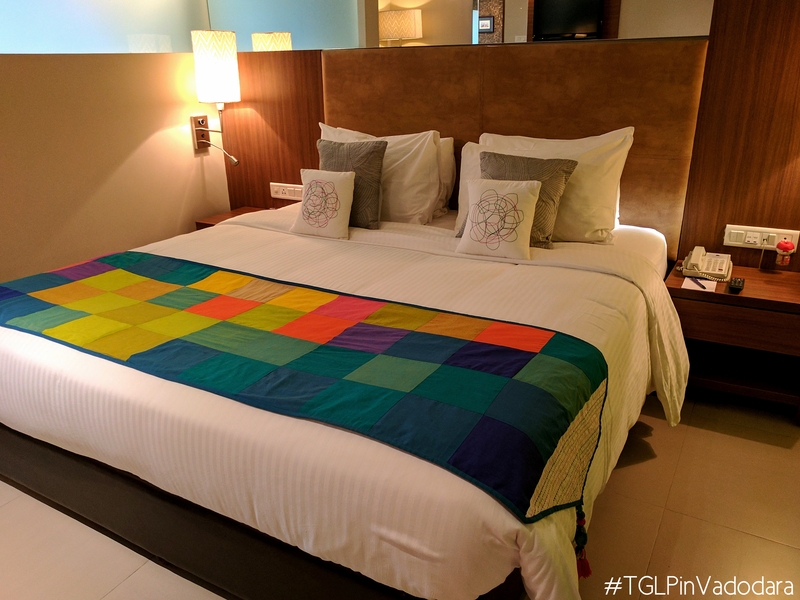 This, in the end, shows the hotel’s connection with the city’s rich cultural heritage but also the deep rooted link it shares with this one of a kind city. For those who know me well, know my love for the arts, crafts and culture. No wonder the art tour around the property made me really happy! 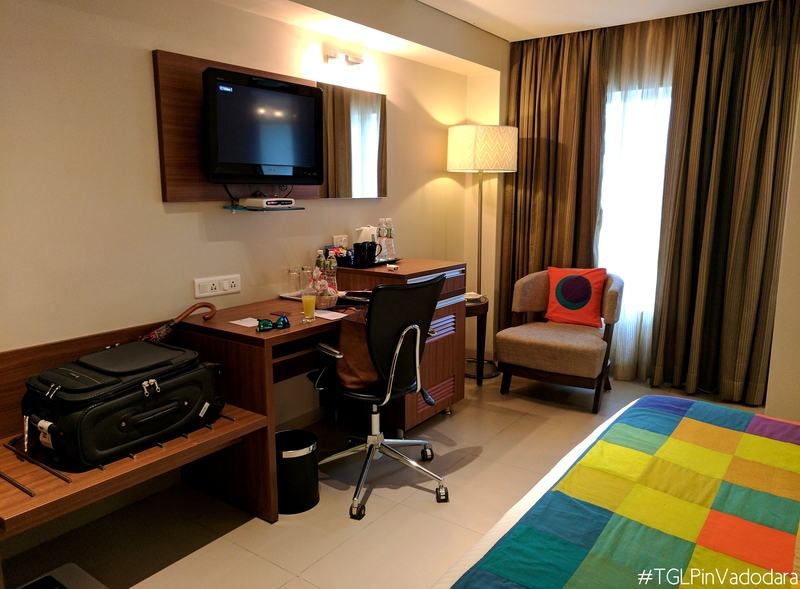 Strategically located in close proximity to Vadodara’s business district and corporate hub, the hotel is the first Grand Mercure to launch in the state of Gujarat. 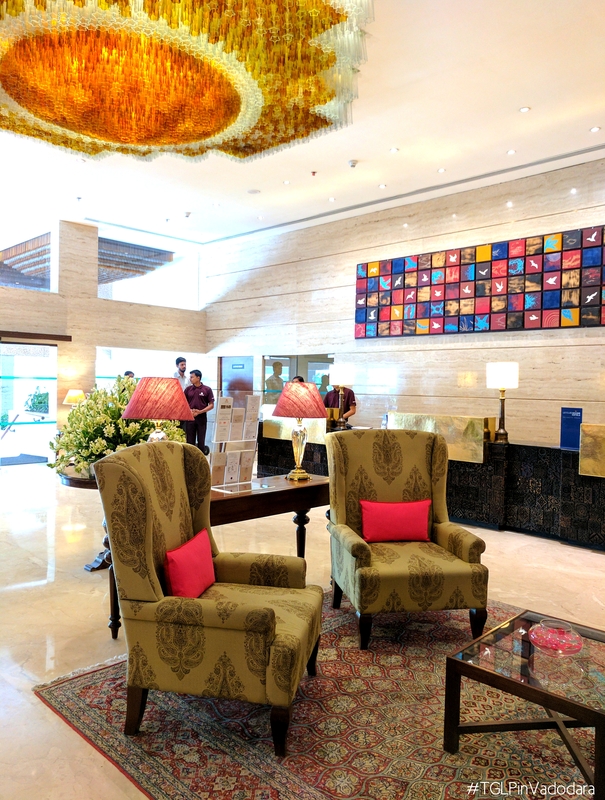 Grand Mercure Vadodara Surya Palace features include five suites, a fitness centre, open-air pool and a wellness centre along with 146 contemporary design rooms, that resonate with the rich traditional culture, art and heritage of this lovely city. 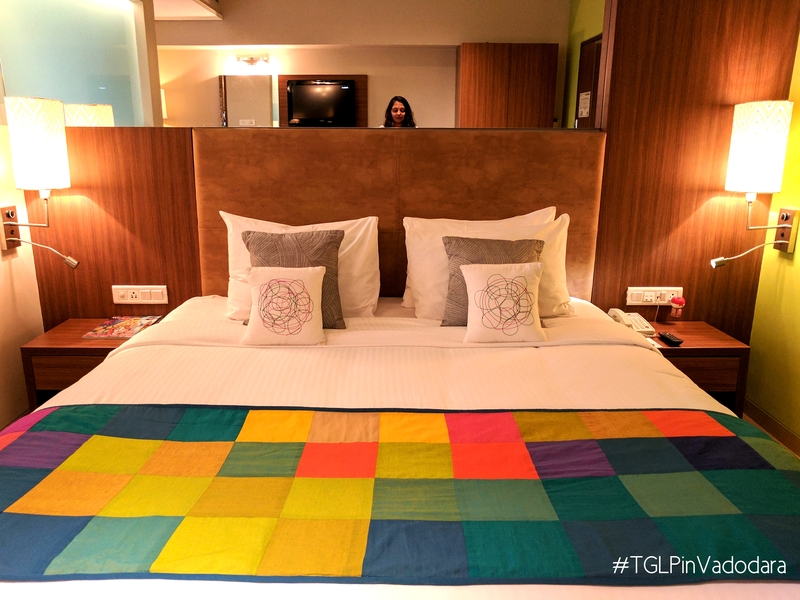 I later learnt that my room’s theme was ‘Kites’ and no wonder I found the colours so appealing (love vibrant rooms)! Although compact by nature, it has been aesthetically designed to make one feel comfortable enough. 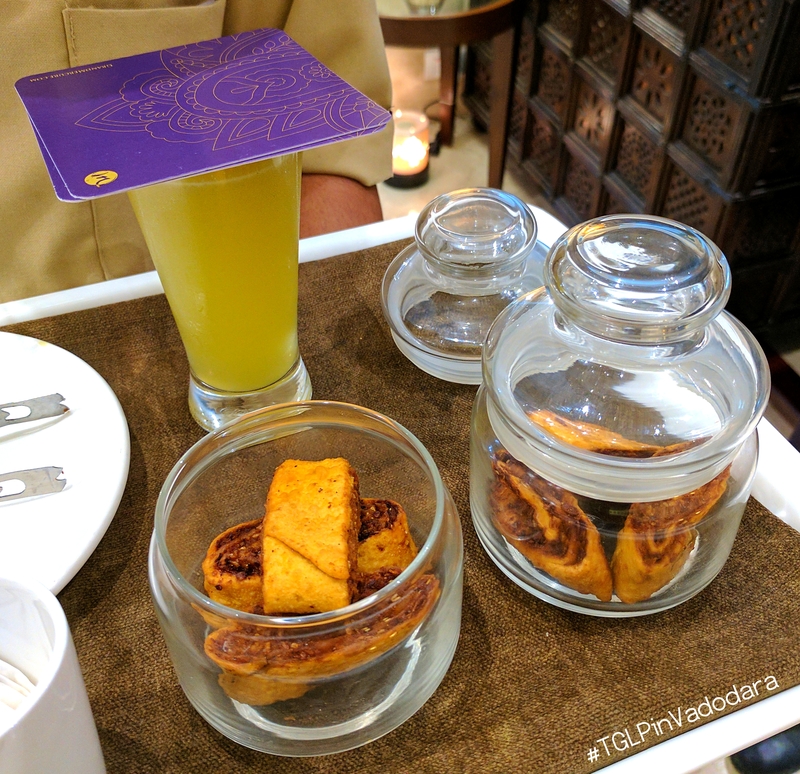 Moving on to the inexplicably warm and welcoming hospitality from the entire team, I was welcomed with a traditional thread mala, bhaakarwadi – a popular local snack and a welcome drink – Herbal Cane Punch which was a more flavourful version of nimbu pani. Refreshingly simple, just like the people here, I felt nothing less than special with the impeccable service I was provided with. While I was walking around, exploring the property, a small room in the lobby area, near the patisserie section caught my eye. The moment I walked in, I knew it was my favourite spot in the entire hotel. 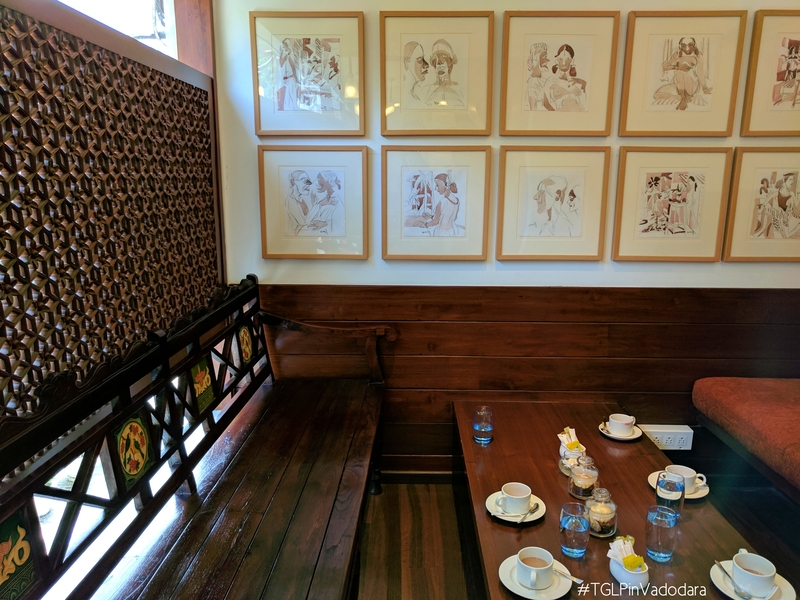 A little cafe-like setup with stunning artworks adorning the walls, all you need is a book and a cup of coffee to make this space your comfort zone. All our meals, whether classically traditional or experimental fusion, were savoured at Azure – their in-house multi cuisine restaurant. Spacious and nicely done up, I fell in love with the painting murals on the walls here. Well, since I want to talk about all the meals we had, I’ll have to dedicate a fresh new blog post for it and that is exactly what I will do, so stay tuned. 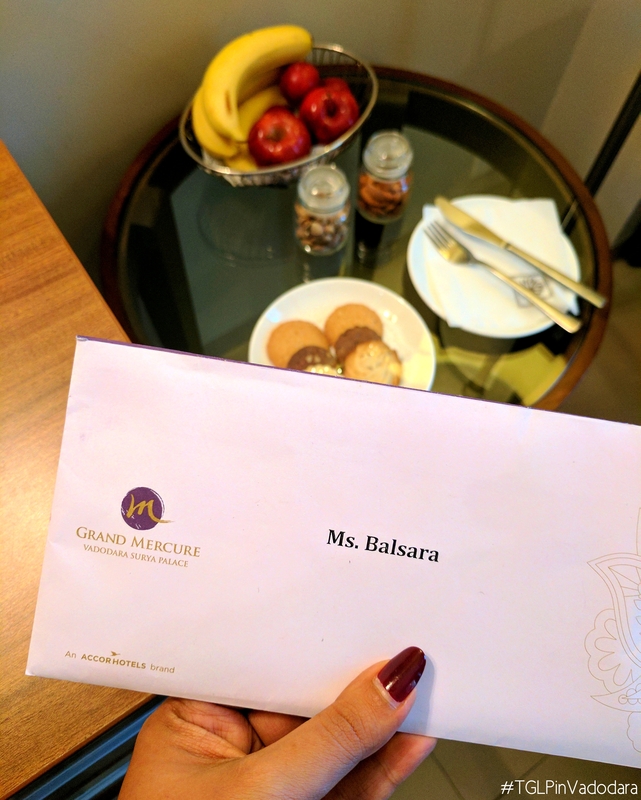 In the meantime, I met some of the nicest people who make Grand Mercure Vadodara Surya Palace special and somewhere I’d like to revisit I genuinely believe it’s the people who make a place. No matter how fancy the decor is, or what facilities it boast of, if the people behind it are not only good at their job but also go the extra mile to make it special, then it’s certainly a reason to stand out. A big thank you to Mr. Rajesh Gopalkrishnan, the General Manager who was kind enough to join me on my 1st solo meal and enlightened me about the hotel. Mrs. Binaifer Gai, Director of Sales who was the sweetest with gestures I wasn’t prepared for but was thoroughly overwhelmed with. And of course, all the other staff members who made it nothing less than memorable. For more info. about the hotel, click here.